The wolverine comes marked with a reputation based on myth and fancy. Yet this enigmatic animal is more complex than the legends that surround it. With a shrinking wilderness and global warming, the future of the wolverine is uncertain. The Wolverine Way reveals the natural history of this species and the forces that threaten its future, engagingly told by Douglas Chadwick, who volunteered with the Glacier Wolverine Project. This five-year study in Glacier National Park  which involved dealing with blizzards, grizzlies, sheer mountain walls, and other daily challenges to survival  uncovered key missing information about the wolverine’s habitat, social structure and reproduction habits. 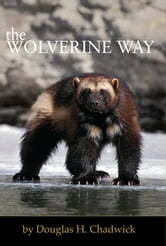 Wolverines, according to Chadwick, are the land equivalent of polar bears in regard to the impacts of global warming. The plight of wolverines adds to the call for wildlife corridors that connect existing habitat that is proposed by the Freedom to Roam coalition.